PRODUCT: WESTERN COLLOID #298E PREMIUM COLD APPLIED ELASTOMERIC RUBBERIZED ASPHALT EMULSION & DAMP PROOFING. 5-GALLON PAIL. PRICE/PAIL. DESCRIPTION: Western Colloid’s #298E is an asphaltic bentonite clay emulsion modified with acrylic rubber to achieve a permanently elastomeric waterproofing compound and surface coating. Product #298E resists checking and cracking. The cured film remains flexible and will not sag, flow or re-emulsify. Special unblown soft asphalts help improve the weathering characteristics of Product #298E as well as enhance resistance to industrial pollutants, contaminants and corrosives. Premium acrylic rubbers increase the elongation of Product #298E and also give it greater adhesion and low temperature flexibility. Base coat for cold fluid applied seamless fabric-reinforced roofing system. Forms part of many of Western Colliod UL Class-A and or Factory Mutual Class 4470 roof systems. Base coat for SilverWhite or Elastahyde reflective coating. Uniform weathering surface for smooth or mineral surfaced composition built-up roofing. 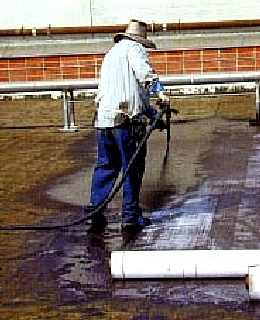 Waterproofing compound for cold process, built-up roof systems utilizing polyester and or fiberglass reinforcements. Protective surface for metal roofing, masonry, stucco, parapet walls, curbs and base flashings. Corrosion resistant surface for most exterior metal surfaces. Damp proofing compound for below grade walls. Packaging: 5G, 55G, bulk totes and tankers (call for special bulk pricing). WESTERN COLLOID #770 AXP, ELASTAHYDE ELASTOMERIC ACRYIC ROOF BASE COAT. WHITE COLOR. PONDING WATER RATED. FOR ROOFS INCLUDING FOAM, METAL, ASPHALT AND APP MODIFIED BITUMEN ROOFS. ROLL-ON GRADE. 5-GALLON PAIL. PRICE/PAIL.